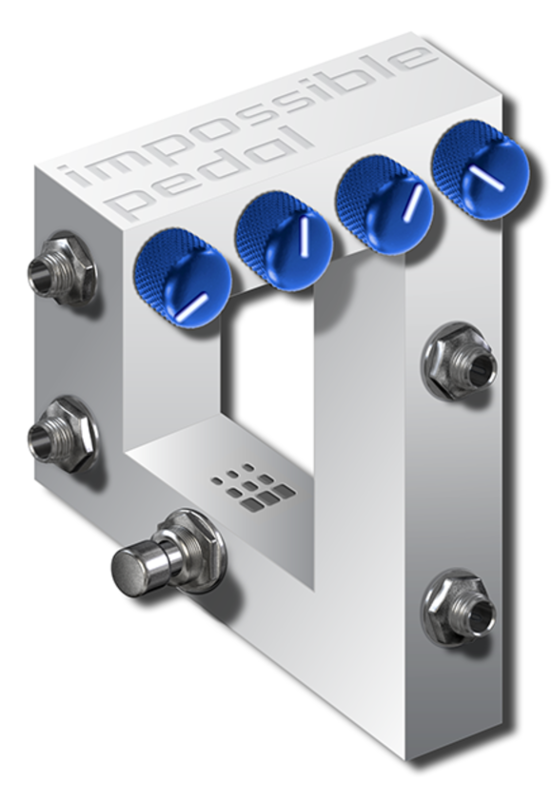 ANAHEIM, California – At NAMM 2013, DigiTech is proud to announce its first in a line of iStomp Signature Artist e-pedals, joining forces with guitarist extraordinaire Adrian Belew to debut The Impossible Pedal. The e-pedal lives up to its name, giving guitarists the ability to play impossible guitar riffs that you would never think to play. Adrian Belew needs little introduction as a beyond-cutting-edge musician who has smashed sonic boundaries with artists including David Bowie, King Crimson, Talking Heads, Frank Zappa, Nine Inch Nails and others, and over a diverse solo career spanning nearly 20 solo albums. The cries, grunts, squeals, industrial noises, twang-bar-king whammy effects and other otherworldly sounds he can coax out of his instrument make him one of the world’s most uncategorizable guitarists. Two knobs on The Impossible Pedal set the two different pitch intervals and two knobs select whether the pitches shift up or down over a two octave range. By stepping on the footswitch, the note played by the guitarist alternates between the standard (unaffected) pitch and the two pitch-shifted voices, to create melodic passages that extend beyond physical human ability. Even its iStomp icon is an impossible optical illusion that has to be seen to be disbelieved. “Adrian Belew is a fearless innovator and his e-pedal ideas for the iStomp are a perfect match for our vision,” noted DigiTech Artist Relations Manager Tom Cram. The DigiTech iStomp is a new concept in guitar stompboxes that allows musicians to turn the iStomp into any pedal available in the Stomp Shop online pedal store. Offering almost limitless sonic possibilities, the iStomp connects to an Apple® IOS device where musicians can use the free Stomp Shop app to load it with the e-pedal of their choice. The Stomp Shop app comes with ten of the most popular pedals and gives access to more than 40 additional e-pedals they can browse, try out and purchase. More e-pedals are added on a regular basis. At NAMM, DigiTech will be giving away six special edition silver and blue iStomp pedals signed by Belew as part of a Facebook sweepstakes that is taking place during the show. Please visit DigiTech at the Anaheim Convention Center, Anaheim, CA Booth #211B. The DigiTech The Impossible Pedal e-pedal will be made available at the beginning of NAMM at a suggested retail price of $19.99. The DigiTech iStomp is currently available at $229.95 suggested retail.